The vote was 248-181, falling short of the two-thirds majority needed. Only 14 Republicans joined Democrats to vote to overrule the president. Already, organizations including the American Civil Liberties Union and more than 16 states are pursuing lawsuits challenging Trump’s declaration. As Pelosi and Senate Minority Leader Chuck Schumer have previously stated, they could be interested in bolstering such efforts. The Pentagon won’t allow its plan to interfere with military readiness, Acting Defense Secretary Patrick M. Shanahan told members of Congress on Tuesday, seeking to ease concerns about the controversial shift of appropriated funding made possible by President Trump’s declaration of a national emergency. 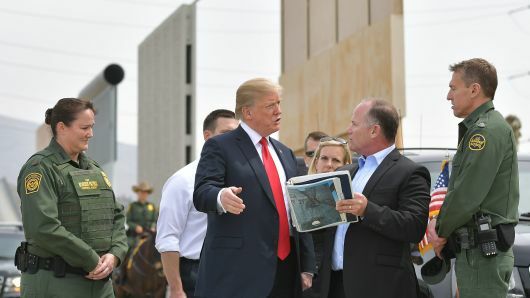 “Military construction on the border will not come at the expense of our people, our readiness, or our modernization,” Shanahan told the House Armed Services Committee on Tuesday. Opposition to pulling funds from the Armed Forces is being heard from Democrats who are already pushing back. Committee Chairman Adam Smith, D-Wash. said the move would likely compel Congress to strip the Pentagon of the authority to “reprogram” funds that have been appropriated for specific purposes and programs.